We've hit the 'blahs' and I don't know what to do. I'm hoping Thursday's lesson will cure it. I post this not to complain, but out of honesty. There are ups, downs and plateaus on this journey, and it's so easy for me to only post the ups and cover the downs with filler posts. This is a down, and that's okay, we're allowed to have those. Last Thursday's lesson pushed Connor's envelope a little bit, and he reacted, as usual, by being a bit flustered. This is normal; you should have seen his flustered meltdowns when we were first learning turns on the forehand two years ago. 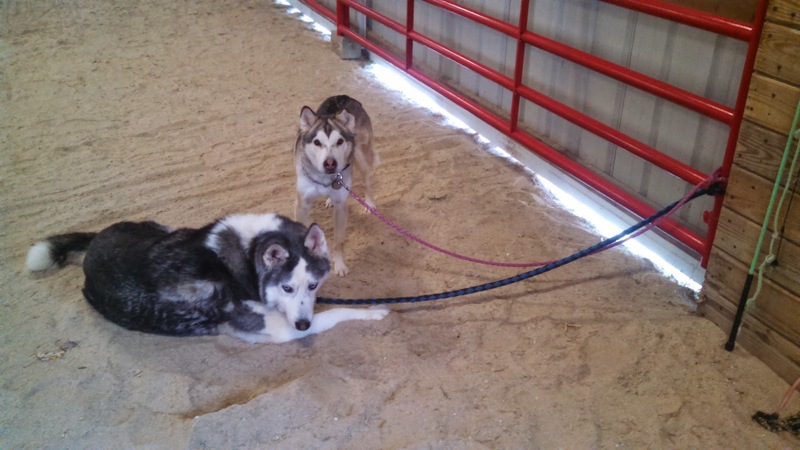 Worst barn dogs ever hang out in the indoor during my Tuesday morning ride (off for the election). But my two rides since then have been...spicy. Angry. I can't get him to bend left, I can't get him straight in either direction, lateral leg sends him flying forward, he won't relax. I thought maybe it was the post-clip sillies, and maybe it is, combined with me blocking him somewhere. But I can't figure out where. Part of me wonders if I should back off and give him a vacation, but part of me thinks this is something to push through. He's not bored, he's not in pain, and we have not been overdoing it in the sandbox. If anything, he's probably annoyed with having to do picky Dressage work after jumping so much the past three months. Besides, I know he'll get a vacation around Thanksgiving, so why stop now? Part of me thinks we're missing something somewhere, some building block that would make what we're doing now make more sense. Or maybe we had it before we focused so hard on jumping, but we don't now. It's just another two steps forward, one step back, but man it's frustrating when the basic Dressage isn't there. Hang in there. Hopefully you'll get him all straightened out in your next lesson. What were you working on? I know you were pushing the envelope of flexion and collection on circles in your last lesson. Don't underestimate how hard that is for them. Sure, he gave you some, but he's probably sore. He probably doesn't fully understand. He also probably doesn't wanna. I'm not saying give up, or give in. But it's a rough and ugly transition while they get more flexibility and more strength to do what you're asking. Think the fits Pig was throwing me all summer about flexion. Now? I raise my inside hand and he comes right in. He has the strength to do it it now, because we struggled through the ugly and the tension. Going through the same thing with Penny too! BUT - I think she is uncomfortable so the vet is out today to give her a once over. Sometimes I do think even 2-3 days off might help both bodies and minds - of horse and rider. Won't hurt anything and when you return - you can see where you are at. That's sucky, your basics are so important! Do you think it's just the changing of seasons? My horse gets quite tense and overreacts around this time of year, for Spring, and as we get to autumn. I think it's the increased rainfall affecting the grass/crops going into hard feed. That could be waaaay off though haha and hopefully it's a quick fix that you figure out in your lesson! Thank you south for sharing! I, for one, know I appreciate reading about both the good and bad and it gives me hope that we'll be as good as you guys one day! Hi, Don't want to sound too simple, but have you checked his teeth lately? After two dentists, finally found one that helped Rory-it can make all the difference. sounds frustrating! but also, like you say, part of the ups and downs. i'm kinda with you on the 'keep plugging away at it' idea, and wish you luck! Loki and I have been struggling with the bend to the right for what feels like forever. It does seem like there are just times when everything is a fight and then all the sudden you come through it and it is awesome. Hopefully you guys will get there soon!